Enjoy a free hotel pickup or make your way to Holt Street, Pinkenba - Before a cruise across Moreton Bay Marine Park to the whales playground. Each year humpback whales migrate from Antarctica to the sub-tropical waters of eastern Australia, where they give birth. 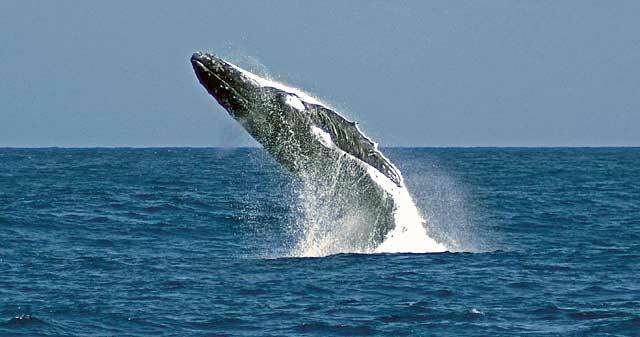 At least 2000 humpbacks migrate approx. 6000km to the Great Barrier Reef, Hervey Bay and Moreton Bay. Groups (or pods of whales) start arriving in mid June. The humpback whale is the fifth largest of the great whales, Adult females grow up to 15m, and a mature humpback can weigh 40 tonnes. Breaching - Propelling most of its body from the water, the whale then turns to crash spectacularly into the ocean. This display's the humpback's grace and vigour. Fin Slapping - As Humpback whales come to the surface, often they can show their pectoral fins, one or both can be seen slapping the ocean. The Blow - Often, this is the first sign of whale activity. Adult humpbacks have tow lungs. As they surface, the whale exhales forcefully through two blowholes on top of its head. A distinctive cloud is formed from the condensation and from the sea water collected around the blow hole. Spy Hop - A favourite sight is a stationary whale on the surface with each head and eye showing. Often they can almost rise straight out of the water so its eyes are clearing the surface, before slipping back into its underwater world. Tail Slapping - While submerged near vertically, a humpback whale can slap its flukes (tail) on the surface of the sea water. On many occasions, this can be seen for up to 20 seconds. After a light lunch return north with views of Flinders Reef and Cape Moreton Lighthouse, spot dolphins, turtles and stingrays. a seat on the next available cruise will be offered or a full refund. 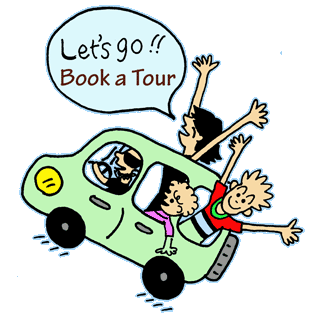 A sensational tour combining two magical experiences into the one fantastic package! We depart the Brisbane River, with great views of the Gateway Bridge, Nudgee Beach and Boondall Wetlands Reserve. We enter Moreton Bay and Island Marine Park. In the distance spot North Stradbroke Island, Peel Island and the sandhills on Moreton Island. A brief stop over at Tangalooma Resort before boating the inside of Moreton Island. We arrive the Whale Playground! With large decks providing comfort with full views of the giant humpbacks seen breaching - Fin slapping and more. 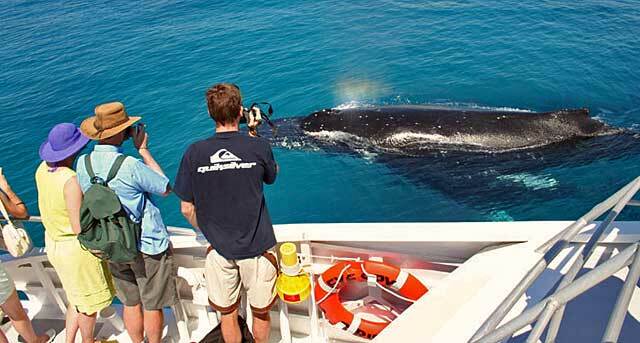 With expert commentary learn of the migrating humpback whales characteristics. Enjoy these acrobats of the sea, often with their newborn calves, creating one of the greatest shows of the ocean. After a light delicious lunch return to the famous Tangalooma Wild Dolphin Resort and take advantage of the facilities, enjoy a drink at the bar, some shopping at the stores, or a play on the pristine beach and a swim in the crystal clear waters of Moreton Bay. That evening, the second half of your tour begins! 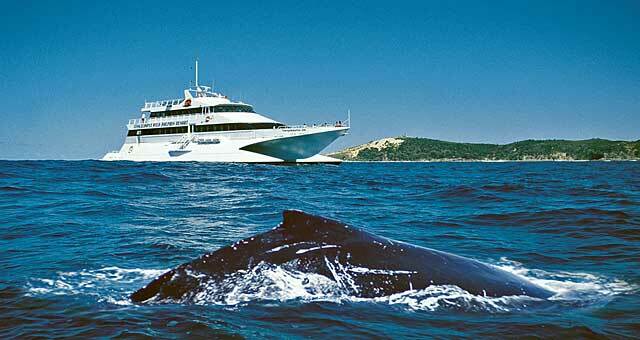 Moreton Island has attracted schools of dolphins to its tranquil shores daily for more than forty years. Tangalooma dolphins eagerly swim up to the beach adjacent to the well-lit jetty, where you will enjoy the experience of hand feeding fresh fish to these amazing animals. Dolphin feeding is suitable for all ages. 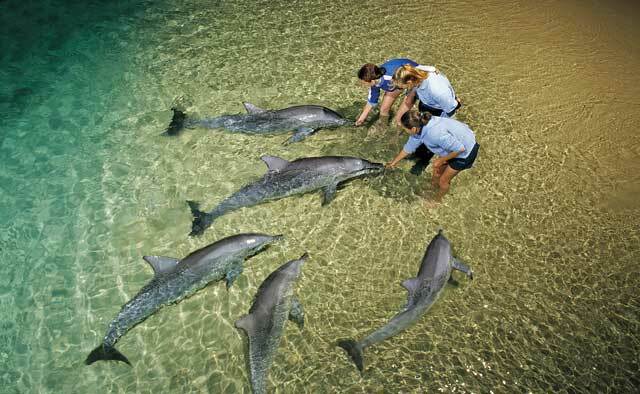 Enjoy getting up close and personal with the dolphins directly in front of the Resort. Once the feeding is over, board the air conditioned luxury catamaran for your return journey to the Brisbane River.